The Department of Sociology builds on its historical connections to European social science and further develops the ideas and thinking for today's world. 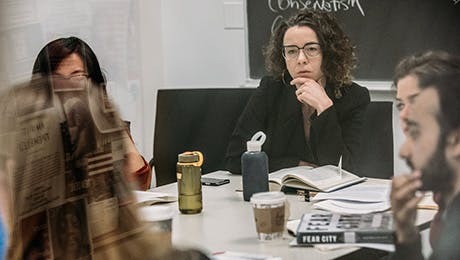 Develop a uniquely insightful approach to the investigation of social life alongside faculty and students who conduct research and critical inquiry that engages with academic communities around the globe. The Department of Sociology emphasizes theoretically-informed ethnographic, historical, and interpretive inquiry into the significant social issues of our times in local, national, and transnational contexts. The department is a vibrant hub of scholarship and intellectual life for our students, faculty, and visitors from many countries. The core academic areas of research of the Department of Sociology reflect the interests and research of our renowned faculty: social inequalities; culture and politics; law, rights, and citizenship; historical and comparative sociology; and cities and publics. Through the department's activities, our goal is to help students better understand the major transformations in modern and postmodern societies and to prepare them for the normative or analytical challenges these transformations continually pose. The Department of Sociology offers master's and doctoral degrees in Sociology. At the PhD level, a minor field in Historical Studies is offered in association with the Committee on Historical Studies. Our courses offer a scholarly approach to understanding how societies work, why societies change, and where societies will go next. These courses cover the theory behind societal transformation through advanced academic inquiry, spirited debate, rigorous research, and critical thinking.